In C++, it's possible to change the way operator works (for user-defined types). In this article, you will learn to implement operator overloading feature. 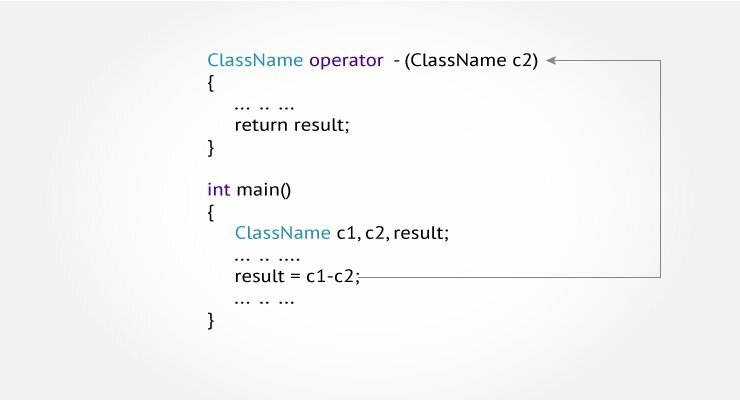 This feature in C++ programming that allows programmer to redefine the meaning of an operator (when they operate on class objects) is known as operator overloading. Why is operator overloading used? How to overload operators in C++ programming? Here, returnType is the return type of the function. The returnType of the function is followed by operator keyword. You can pass arguments to the operator function in similar way as functions. Operator overloading allows you to redefine the way operator works for user-defined types only (objects, structures). It cannot be used for built-in types (int, float, char etc.). Two operators = and & are already overloaded by default in C++. For example: To copy objects of same class, you can directly use = operator. You do not need to create an operator function. Operator overloading cannot change the precedence and associatively of operators. However, if you want to change the order of evaluation, parenthesis should be used. There are 4 operators that cannot be overloaded in C++. They are :: (scope resolution), . (member selection), . * (member selection through pointer to function) and ? : (ternary operator). Operator overloading allows you to define the way operator works (the way you want). In the above example, ++ operator operates on object to increase the value of data member count by 1. However, if you use the following code. It decreases the value of count by 100 when ++ operator is used. This may be technically correct. But, this code is confusing and, difficult to understand and debug. It's your job as a programmer to use operator overloading properly and in consistent way. It is because the return type of the operator function is void. How to overload increment operator in right way? How to overload binary operator - to subtract complex numbers?